These are vintage disc pendants that were made in Italy. They are done in an pink marble color. These have a beading hole at the top. They would make great earrings in addition to becoming a pendant. These measure 40mm. You will receive 2 pieces. I have these listed in a smaller size too. Love the color of these beads...perfect for Spring! Wow! 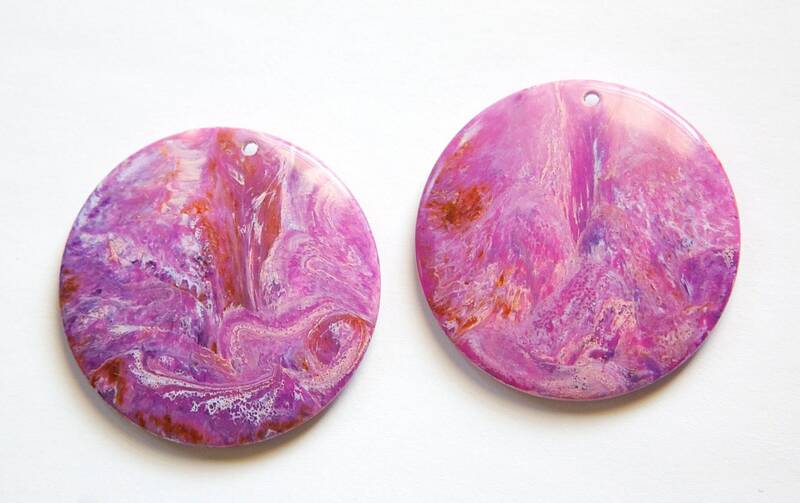 A lovely marbling of pinks and purples and whites to create the finish of these disc beads. Very dramatic colors and quality of craftsmanship. Could be earrings, pendants, charms - so many possibilities - these are fabulous. Thank you for carefully packaging my purchase to arrive in a timely manner and undamaged by the rigors of travel. I will certainly be back soon.